From Goodreads: In this companion novel to the critically acclaimed Some Quiet Place, Alex must choose between Revenge and Forgiveness. For as long as she can remember, Alexandra Tate has been able to see personified Emotions, and she’s found a best friend in Revenge. He’s her constant companion as she waits outside Nate Foster’s house, clutching a gun. Every night since Nate’s release from prison, Alex has tried to work up the courage to exact her own justice on him for the drunk driving accident that killed her family. But there’s one problem: Forgiveness. When he appears, Alex is faced with a choice—moving on or getting even. It’s impossible to decide with Forgiveness whispering in one ear . . . and Revenge whispering in the other. 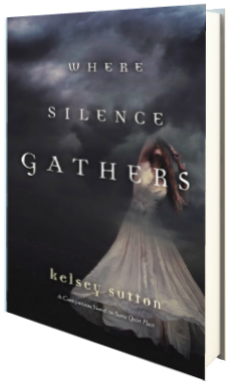 This novel is a companion to Some Quiet Place; a standalone that is set in the same world, but with different characters. Whereas Some Quiet Place focuses on Elizabeth, a young woman unable to feel emotion, and her relationship with Fear, Where Silence Gathers brings us new characters and emotions in that of Alex, Revenge, and Forgiveness. Alex is a fairly complex character and I enjoyed getting to know her. I can’t imagine how I would react should my family be decimated by a drunk driver, and I certainly don’t know how I’d react should said drunk driver be released from prison, only to come back to town as a constant reminder of what I lost. Alex struggles, and I found her struggle to be an extremely real one. While I’d like to say that I wouldn’t act like her, that I wouldn’t allow my family’s death to consume my life, I feel like that’s a lie, and I’d most likely be in the same boat as Alex. With Revenge as a constant companion, Alex has many choices to make—and some of them are quite horrible, but as she grows throughout the novel, I liked how she began to connect with Forgiveness and begins to come back into herself—the girl she was before the death of her family. I wasn’t expecting the final truth about Revenge and Forgiveness—I was surprised, but in retrospect, I don’t think I should have been; it only makes perfect sense. There is an added element of mystery to this novel as well as Alex learns about information she found on her father’s flash drive, and I enjoyed this aspect of the story as well, though I preferred that of the emotions and their constant companionship of Alex. I just find it so cool to think that emotions are invisible entities that constantly appear and interact with us, without our knowing. Overall, this series is a unique, interesting read. If you’re looking for something different, I highly suggest picking it up. Four stars. I’m glad this is different. I have to catch up! Thanks.